Arnold Genthe (January 8, 1869 – August 9, 1942) was a German-born American photographer, best known for his photographs of San Francisco's Chinatown, the 1906 San Francisco earthquake, and his portraits of noted people, from politicians and socialites to literary figures and entertainment celebrities. Left: Genthe photographing Jack London and friends in Carmel-by-the-Sea, California. Right: The resulting photograph. Arnold Genthe was born in Berlin, Prussia, to Louise Zober and Hermann Genthe, a professor of Latin and Greek at the Graues Kloster (Grey Monastery) in Berlin. Genthe followed in his father's footsteps, becoming a classically trained scholar; he received a doctorate in philology in 1894 from the University of Jena, where he knew artist Adolf Menzel, his mother's cousin. After emigrating to San Francisco in 1895 to work as a tutor for the son of Baron and Baroness J. Henrich von Schroeder, he taught himself photography. He was intrigued by the Chinese section of the city and photographed its inhabitants, from children to drug addicts, Due to his subjects' possible fear of his camera or their reluctance to have pictures taken, Genthe sometimes hid his camera. He also sometimes removed evidence of Western culture from these pictures, cropping or erasing as needed. About 200 of his Chinatown pictures survive, and these comprise the only known photographic depictions of the area before the 1906 earthquake. After local magazines published some of his photographs in the late 1890s, he opened a portrait studio. He knew some of the city's wealthy matrons, and as his reputation grew, his clientele included Nance O'Neil, Sarah Bernhardt, Nora May French, and Jack London. In 1904 he traveled to Western Europe and Tangier with the famous watercolorist, Francis McComas. In 1906, the San Francisco earthquake and fire destroyed Genthe's studio, but he rebuilt. His photograph of the earthquake's aftermath, Looking Down Sacramento Street, San Francisco, April 18, 1906, is his most famous photograph. Within a short time, Genthe joined the art colony in Carmel-by-the-Sea, where he fraternized with the literary elite, including George Sterling, Jack London, Harry Leon Wilson, Ambrose Bierce, and Mary Austin. Here he was able to pursue his work in color photography. Of his new residence, he wrote, "The cypresses and rocks of Point Lobos, the always varying sunsets and the intriguing shadows of the sand dunes offered a rich field for color experiments." Although his stay in Carmel was relatively short (1905–07), he was appointed in 1907 to the Board of Directors of the Art Gallery in Monterey’s luxury Hotel Del Monte, where he insured that the work of important regional art photographers, such as Laura Adams Armer and Anne Brigman, was displayed with his own prints. By the spring of 1907 he had established his residence and studio at 3209 Clay Street in San Francisco, where he continued to enjoy membership in the celebrated Bohemian Club, attend prominent society functions, display his own work, and pen newspaper reviews of photo and art exhibitions. In 1911 he moved to New York City, where he remained until his death of a heart attack in 1942. He worked primarily in portraiture, and Theodore Roosevelt, Woodrow Wilson, and John D. Rockefeller all sat for him. His photos of Greta Garbo were credited with boosting her career. He also photographed dancers, including Anna Pavlova, Isadora Duncan, Audrey Munson and Ruth St. Denis, and his photos were featured in the 1916 book, The Book of the Dance. Genthe was an early adopter of the autochrome color photography process. He began experimenting with the process in 1905 in Carmel, California. He claimed credit for the first exhibition of color photographs in America; later scholars determined this is not accurate, but he was undoubtedly one of the earliest. His subjects included portraits, artistic nudes, and landscapes. Genthe owned a cat called Buzzer. Buzzer often appeared in portraitures with Genthe's subjects, most notably Broadway actresses to whom the cat warmed. One such sitting in autochrome was with actress Ann Murdock. Mel Byars, N. Elizabeth Schlatter, "Genthe, Arnold". American National Biography Online. Feb. 2000. Accessed September 2006 (subscription required). ^ Kaneti, Marina. "Arnold Genthe." In Immigrant Entrepreneurship: German-American Business Biographies, 1720 to the Present, vol. 3, edited by Giles R. Hoyt. German Historical Institute. Last modified August 28, 2014. ^ The Argonaut (San Francisco), 22 August 1904, p. 126. ^ a b Edwards, Robert W. (2012). Jennie V. Cannon: The Untold History of the Carmel and Berkeley Art Colonies, Vol. 1. Oakland, Calif.: East Bay Heritage Project. pp. 46, 49–50, 68, 175, 311–312, 324, 378–379, 479, 499, 508, 516, 563, 669, 689. ISBN 9781467545679. An online facsimile of the entire text of Vol. 1 is posted on the Traditional Fine Arts Organization website ( "Archived copy". Archived from the original on 2016-04-29. Retrieved 2016-06-07. CS1 maint: Archived copy as title (link)). ^ Monterey Daily Cypress, 23 April 1907, p. 1. ^ Shields, Scott. Artists at Continent's End: the Monterey Peninsula Art Colony, 1875-1907. Berkeley: University of California Press. pp. 196ff. ^ a b Wood, John (1993). The Art of the Autochrome: The Birth of Color Photography. Iowa City: University of Iowa Press. pp. 46–48. Wikimedia Commons has media related to Arnold Genthe. 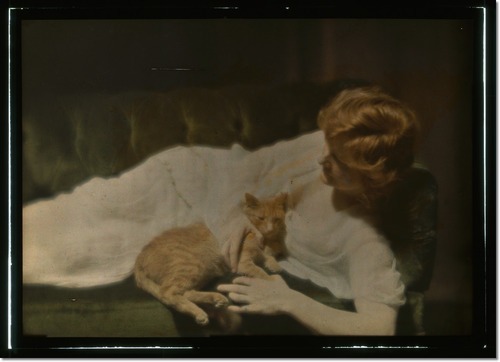 autochrome with Ann Murdock and "Buzzer"